Voters will have to decide during next week's midterm elections New York's governor. 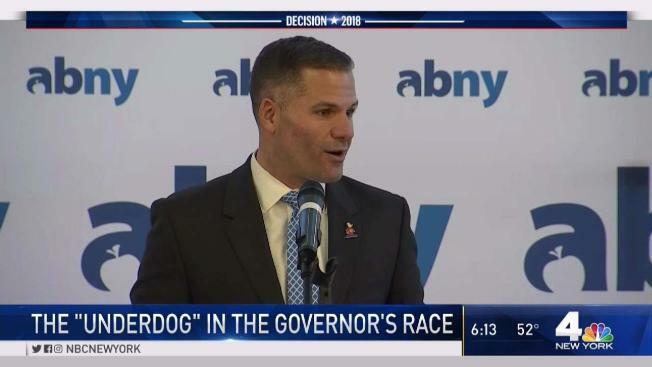 NBC 4's Melissa Russo met up with Republican challenger Marc Molinaro who is embracing his role as the "underdog." Marc Molinaro, the Republican challenger to Gov. Andrew Cuomo, interrupted his own campaign schedule to help a man suffering from an apparent stroke. The Dutchess County executive and GOP nominee for governor was near his campaign office in Poughkeepsie last week when he saw a man on the sidewalk in medical distress. Molinaro and another passer-by attempted to intervene when they spotted the semi-conscious man choking on his own vomit. Authorities were called and Molinaro stepped in to direct traffic as emergency personnel sought to treat the man, who authorities later said was apparently suffering a stroke. When asked how he knew how to direct traffic, Molinaro cited his 15 years working as a volunteer firefighter. "I'm just glad I was there to help," he later told reporters.